Heat little oil in a pan and roast grated coconut, fennel seeds, 3 shallots sliced and few curry leaves until brown. Switch off and then add chilli powder and coriander powder and mix well. Grind it to a smooth paste and keep it aside. 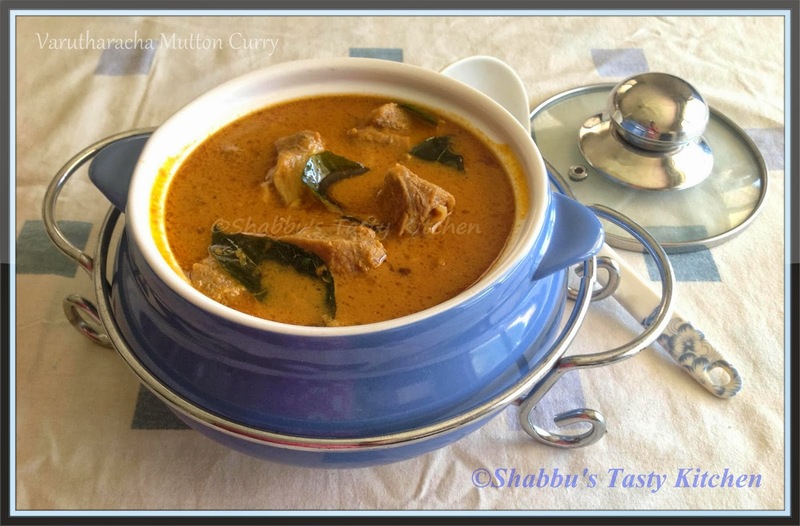 In a pressure cooker, add cleaned mutton pieces, sliced onions, tomato, ginger paste, garlic paste, turmeric powder, salt and pressure cook adding little water. Add the ground coconut paste to the cooked mutton and allow to boil in medium flame. Heat little oil in a small pan and add 2 shallots sliced and few curry leaves and fry till brown and pour this to the curry and boil for another 2 minutes.